· Beauty mode, with special beauty mode in the app, can make your photos and videos more beautiful and amazing! · 3D trigger, headless mode and one-touch return function, which offer a lot of flying pleasure. 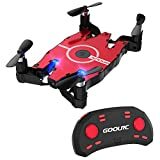 · G-sensor mode and barometer altitude hold function easily control the drone by tilting the phone and providing a simple and simple take-off / landing operation. · The foldable design, which is only 0.95 cm thick, offers great portability and is easy to carry.